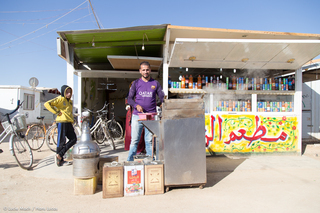 The Jordanian Gouvernment and United-Nations have opened in July 2012 a Refugee camp in Zaatari as an answer to the large influx of refugees fleeing war in Syria. 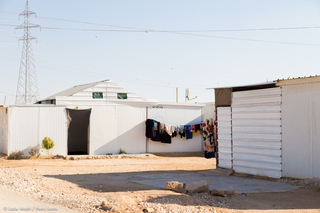 Located in the North of Jordan in a desert, few kilometers away from the conflict, the camp stretches over 5km2 and is the second largest Refugee camp in the world. Today they are about 80 000 people to live in the camp. 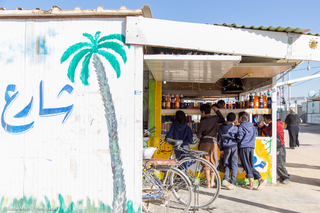 They though they would stay for few weeks but it turns now into years.Tents made way for small containers called «caravans», the camp became permanent and is organised as a city. Not seeing the situation improving, some Syrians decided to start working. To work against the wait, the boreness and the financial dependency. 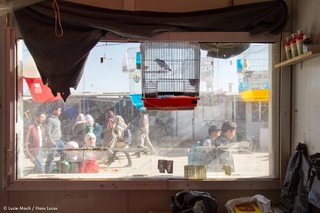 To work to rebuild oneself, to build a new life even if it's inside a refugee camp. 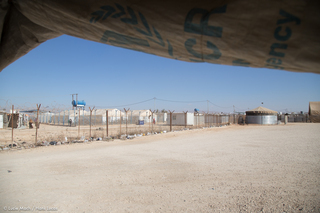 Le gouvernement jordanien et les Nations-Unies ont ouvert le camp de réfugiés de Zaatari en juillet 2012 en réponse au flux de réfugiés fuyant la guerre en Syrie. Situé dans le désert au Nord de la Jordanie, à quelques kilomètres du pays en guerre, le camp s’étend sur 5km2 et constitue le second plus grand camp de réfugiés au monde après celui du Kenya. Aujourd’hui ils sont environ 80 000 à vivre dans le camp. Ils pensaient rester quelques semaines, cela fait maintenant des années. Les tentes ont laissé place aux «caravanes» (sorte de container), le camp se pérénise et s’organise comme une ville. Contre l’ennui et l’attente, certains syriens ont décidé de travailler ne voyant pas la situation s’arranger. Travailler pour lutter contre l’ennui, l’attente et l’indépendance financiere. Travailler pour se reconstruire et se construire une nouvelle vie, même si celle-ci est à l’intérieur d’un camp de réfugiés. Hakam, 43 years old, from Daraa. 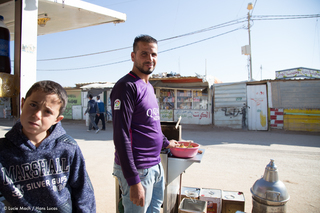 He arrived in Zaatari in 2013 with his wife and his 9 kids. 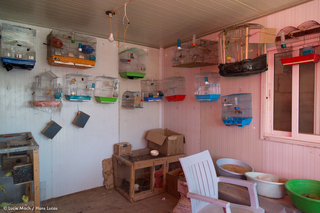 In Zaatari, he sells (food) birds. He owns the business but pay a rent of 40JD / months. 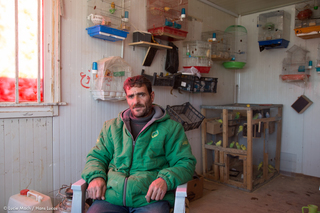 In Syria, he was a taxi driver and use to take care of birds as a hobby. Now he loves it. 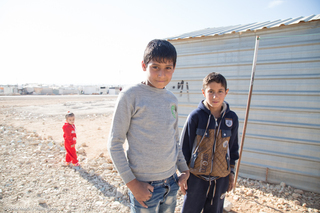 Hakam would like to go back to Syria, he still have one brother living there but his house got demolished. Maybe he will continue to do the same job when he will be back there. Eman, 35 years old, from Daraa. 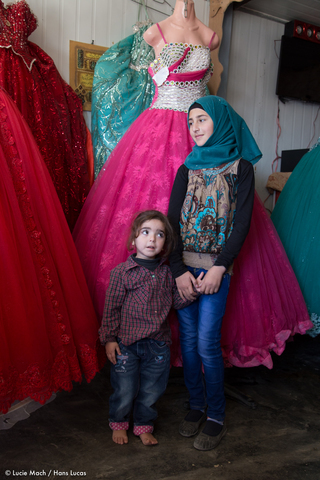 She arrived in Zaatari 3 years ago with her 3 brothers and 3 sisters but they went back to Syria. 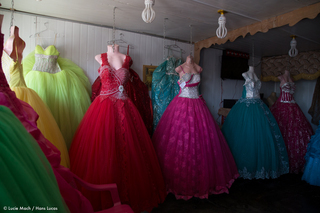 She works as a wedding dress seller since 4 months. 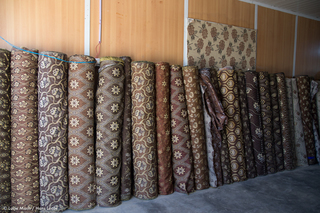 Before, she did the UN rotation work for 20 days but she earns more working in this shop (100JD/month). 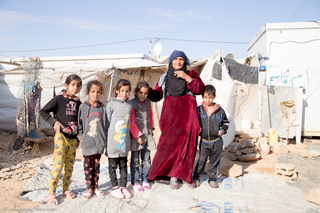 She would like to stay in Jordan but to her, the rent is too expensive to live outside the camp. Asna, 30 years old, from Damascus. 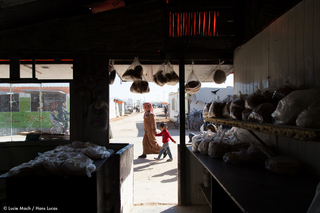 She arrived in Zaatari on March 2014 with her husband and 2 kids. She got one in the camp and the 4th baby is coming. Her husband was working at the Damascus International Airport. 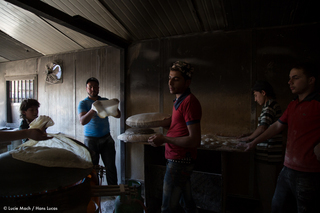 For 3 years they have moved inside Syria from places to places but couldn’t nd bread. 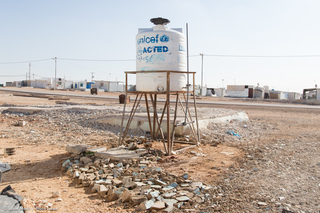 A cousin of her husband told them that Zaatari was a good place to stay with a family. 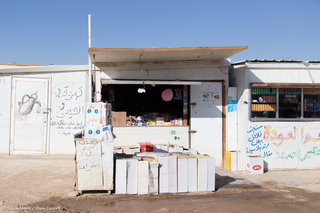 They couldn’t cross the border with their passports so they crossed it illegally and arrived in Zaatari. They gave up with Syria, everything is demolished for them. 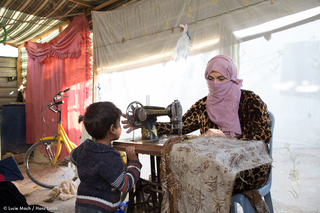 They can’t get a work permit to work outside the camp, they don’t nd job inside the camp but they need money so they buy clothes, clean them, repair them and re-sell them. They want to go out of Jordan, in Canada or in another country. 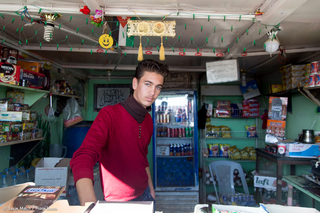 Abdallah, 18, from Daraa. 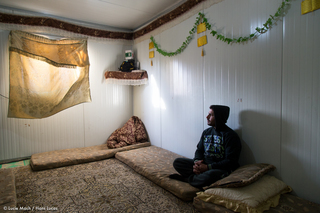 He arrived in Zaatari on February 13th 2012 with his father, 1 brother and 1 sister.The rest of his family came later. In Syria, he nished 8 grates in Syria and wanted to attent the 9th or the 10th grate in Jordan to nish his degree in ICDL but he couldn’t get a scholarship to go to high school. He plans to go back to Syria in 4 months to continue studying. 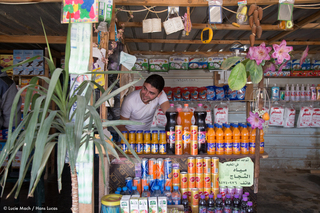 Abdallah work in this shop since 5 months and earn 5 JD a day. 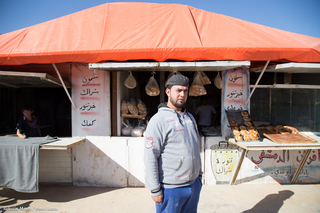 Mohammad, 40 years old, from Daraa. 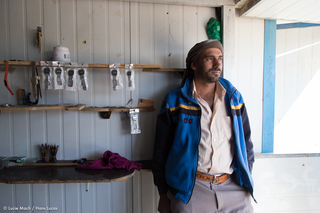 He arrived in Zaatari in 2012 with his wife and his 10 kids. One of his daughter got married in Syria when she had 15 years old. 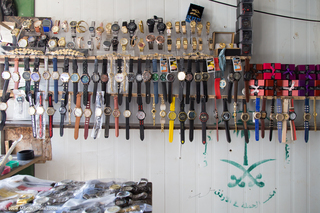 He sells and repair watches, he was doing the same job in Syria. 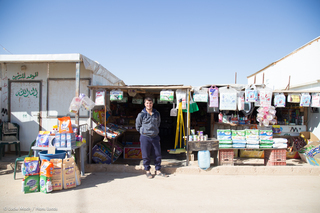 In the camp, he is the only one and works everyday from 10am - 7pm. He own the business but not the place and has to pay 15 JD a month. 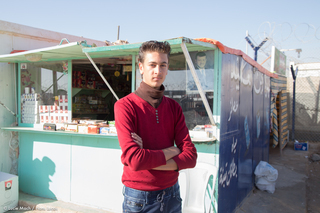 He doesn’t want to be established in Jordan and would like to go back to Syria but isn’t stable yet and his house was demolished but he still have some hope. Ruquai, 31 years old, from Daraa. 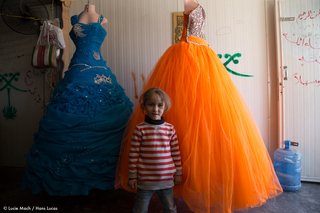 She arrived in Zaatari in 2012 with her parents. She has no more family in Syria. 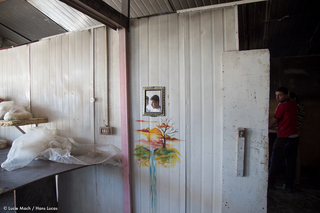 With her parents, they were living in a tent and the UN assigned them 2 caravans, one for her and one for her parents. 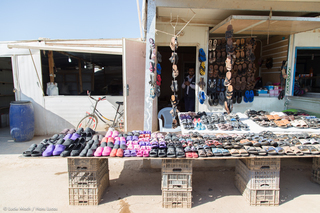 She used to work in a women cloths shop and she decided to use her economy to buy a piece of land to use the second caravan to open a shop. She now owns a women clothes shop and earn enough money to support her family. Clothes are from Ramtha. She can go outside the camp to buy them. Ahmad, 35 years old, from Daraa. 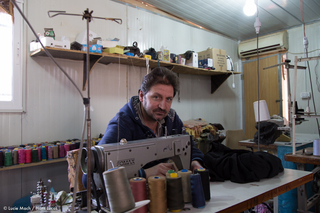 He arrived in Zaatari in 2013 with his wife and his 4 kids. Since he has arrived, Ahmad works as a sewer in the camp. He was doing the same job in Syria. He now earn around 180 JD a month. For him, Jordan isn’t permanent and would rather prefer to go back to Syria. A missile from the regime went into his house but didn’t demolish it. He wishes peace comes back.